Ok, so maybe it was a riesling and not a chablis, but I couldn't resist the temptation to use alliteration after a great evening with friends for the Indianapolis Symphony Orchestra's annual performance at the Ellis Park amphitheater! Anyway, have you noticed that chevron patterns are everywhere these days? I'd like to think that I was ahead of this trend, because I purchased the black and white chevron skirt shown here back in early 2010, but according to Wikipedia (so it must be true, right?! ), chevron designs have been around since at least 1800 BC. I also remember wearing it back in the 70s, when Missoni made it cool (not that I owned anything Missoni in the 70s or even knew who the Missonis were). But, I did have a multi-colored "Missoni-esque" crochet poncho that was hand-made by my mom or grandma, and I still have a couple of beautiful chevron pattern afghans that my Aunt Linda made for me when I was a child. They make me smile just thinking about them, especially the one she made as a gift to match my freshly painted and newly decorated apricot colored bedroom. This time around, the pattern is crisper and preppier than it was in the bohemian 70s, and I've fully embraced it. I recently purchased a green and white chevron skirt online and on sale from Anthropologie. When it arrived, I realized how similar it was to the black and white one I already owned so, even though I liked it, I decided to return it to my local Anthropologie store. Of course, when I got there, I decided to exchange it instead...for the green and navy chevron dress I wore to the symphony in the park. So much for the "too much chevron" philosophy! Have you embraced chevron? 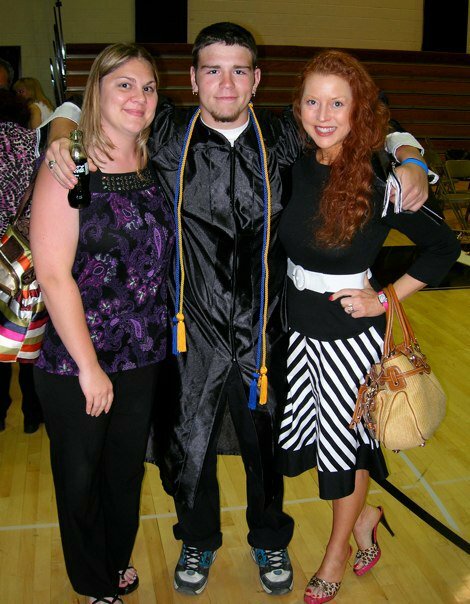 With my sister and brother at his high school graduation, June 4, 2010.